It was through the force of discovering this dharani that the King of Shakyas himself attained enlightenment, and that Avalokiteshvara became the supreme of all the bodhisattvas. Through simply hearing this dharani, a vast accumulation of merit will easily be gained and all karmic obscurations will be purified, and when reciting it, obstacles will not occur. This has been taught in the abridged Prajnaparamita. Other teachings say that by reciting this dharani only once, all the harmful actions you have committed throughout 800,000 kalpas will be purified. 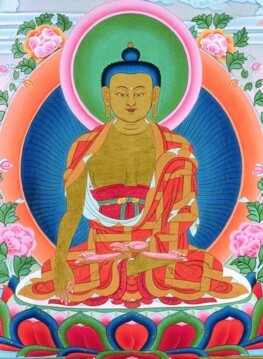 They say that it possesses boundless qualities such as these, and is the sacred heart-essence of Buddha Shakyamuni. This page was last edited on 5 August 2009, at 21:49.